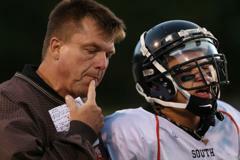 Lenny Sedlock's face shows the battle wounds of 13 years as football coach at Minneapolis South High School. Deep furrows under his prominent brow and lines under his blue eyes. The 52-year-old's stubby, bitten fingernails and cracking voice hint of the daily struggles at the most populated city school, which sits near Lake Street and Cedar Avenue in the heart of one of the Twin Cities' most challenged neighborhoods. South, one of the state's oldest high schools, boasts a 91 percent graduation rate and attracts students with its high academic standards. It has fielded top teams in boys' soccer and girls' basketball. Football is a different story. High on a brick wall in the school cafeteria hang six state championship banners, remnants of South's football pinnacle dating to the 19th century. The last one was won in 1923. These days even titles in the relatively weak seven-team conference of Minneapolis schools elude South's grasp. With the area's top football players best known for leaving South to play in more successful programs, such as rival Washburn or in the suburbs, and academic and off-field problems an ongoing issue, Sedlock's program isn't focused only on wins and loses. Against that backdrop, the coach dreams of restoring the glory that was once South football, replete with players who view the game as a priority and a privilege, a community that turns out for games, and a team that competes every Friday. But for now, the biggest battles at South are ones of player survival, attracting and maintaining top talent, dealing with grade-challenged athletes and teaching hard life lessons to young adults. On the first day of practice, Aug. 13, just 55 players showed up. Sedlock watched kids in jean shorts struggle to perform basic athletic fundamentals. 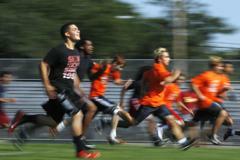 Others in shoes unfit for athletics fell behind during conditioning drills. Some arrived late and left early. Among his better players, three were borderline academically ineligible. Sedlock is tired of reliving this scene each season. Convinced the decline will continue if nothing is done, he set out this year to radically change South football against seemingly impossible odds. He raised the standards of accountability. He turned his focus to building a program around underclassmen. With the team now competing in the newly formed Class 6A of Minnesota's 32 largest high schools, he advocated for the team's jump to the Lake Conference. His bid, which was rejected, would have meant playing much better teams and learning, most likely through blowouts, what it would take to compete. 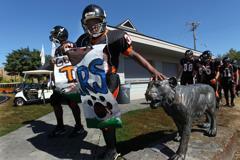 To make it work will mean instilling Sedlock's intense brand of South pride into players. He learned that appreciation when he was a standout player for South in the '70s, and it pulled him back to coach his alma mater after several successful stints elsewhere. "A lot of who I am is from here. A lot of my values were instilled at South. People want to go back and give where they received,'' he said. "I knew it'd be hard but didn't know how hard it'd be. To change the culture ... is very difficult. "They have so many different things going on in life. Football players have to work, babysit, or take care of their elders. Our trainers come over and tell us, 'Did you know that kid hasn't eaten all day?' It's not like a private school here, or the suburbs. Surviving is a tough task with all those things out of our control." Sedlock granted the Star Tribune total access to his program. Here are scenes from a 4-4 season that will continue Friday night when South plays at suburban powerhouse Wayzata in the first round of the 6A playoffs. Eager to unveil his expectations for a better South, Sedlock let loose on opening day. Hovering over his new crop of Tigers on the school's grass field, Sedlock immediately addressed the obvious: The team needs more players. "We're a 6A school. We have 55 guys here today!" he screamed. "I will tell you, almost every 6A school in the state of Minnesota has five times that amount." His players, sitting on the ground or hunched on one knee, listened quietly. He told them freshmen and sophomores would have a real shot at a varsity job. He warned upperclassmen that there were no longer guarantees. "This year is a year of firsts," he said, revealing part of his strategy for reversing the trends that defined the program for most of his time as coach. "We're going to ask you to do things that are pretty tough. We're not going to ask you to do things that are impossible." Plopping down the front steps of his home, Jaylin Bynum knew he'd be late for school. If he timed it right, his trek from his home near Roosevelt High School to South would take about 20 minutes: a nearly mile-long walk to the 38th Street light-rail station, ride to Lake Street, then walk to school. He needed to be out the door at 7:50 a.m. But on this chilly September morning, the returning football starter -- blessed with uncommon speed and the ability to play any position -- was 12 minutes late. He needed to be more punctual, he knew, pointing out how his tardiness cost him a chance to eat breakfast served at the school. Bynum walked past old mills and industrial buildings on the south side before squeezing into a train full of mostly adults. Along the way the 16-year-old discussed "The Great Gatsby'' and its author, F. Scott Fitzgerald. He added that creative writing had begun to interest him. The discussion was unusual for someone who avoided the topic of schoolwork whenever possible as a sophomore. So much so that as his junior year approached, his name was at the top of a list of athletes who Sedlock believed to be academically ineligible. Going through the motions the first day of practice, Bynum couldn't help but wonder if it would also be his last. Whether it was nerves or poor conditioning, he threw up halfway through the morning workout. Later in the day, standing in front of Sedlock to learn his fate, Bynum's dripping sweat couldn't hide the hopeless look on his face. He remained silent as long as possible. "Am I going to be OK?" he finally asked. Sedlock paused before looking him in the eye. "We'll see. ... We'll see." Payton Bowdry is the type of student-athlete South can't afford to lose. His 6-foot-1, lean frame is defined by already-chiseled muscles with plenty of room to grow. Even at 14, the freshman shows leadership, barking at upperclassmen despite dirty looks he sometimes gets in return. He's engaged in class and sits near the front of the room. In the halls, he shows a confident personality and makes time to talk to anyone he meets. On the field, Bowdry attracts attention when he hurdles a defender or runs him over. He has made a mark already as both a running back and a safety. Those qualities, and his athletic abilities, could make him a Division I prospect, a rarity at South, Sedlock believes. Keeping him enrolled is important to the future success of the program. In the moments after an impressive homecoming victory over Minneapolis North, Sedlock was told a parent wanted to talk with him. While normally agreeable, Sedlock groaned and preferred to bask in the victory a bit longer. "It's Payton's mom," assistant coach Byron Carter told him. This was Sedlock's chance to make his case. Racing in their direction, he greeted Payton, his mother, Belinda, and his stepdad, Oscar Robinson. The four stood quietly for a moment, the usually boisterous Sedlock at a loss for words. The coach had wondered if the meeting would ever happen and, if it did, how'd he handle it. Whatever he said could determine whether the freshman and his family would commit to South beyond this year. "So, yeah," Sedlock finally began, breaking an awkward silence. Carter, chimed in: "We want to keep him here. Keep him with the same team, good friends." Belinda told the coaches the family was considering a move to north Minneapolis and she was concerned about how Payton would get to school each day. Robinson suggested that it was time for Payton to learn to use the city bus system. 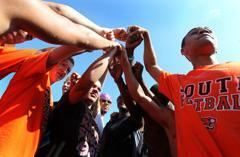 "I'm glad he's got a support system in sports," Belinda said while Sedlock embraced her son. The moment was bigger than Sedlock could have anticipated. Bouncing down the freeway, the yellow bus full of Tigers remained silent. An 18-mile drive to Eden Prairie provided a chance to reflect before meeting the defending Prep Bowl champion. It was the only Class 6A team they would face until this week's playoffs. Underneath his bulky headphones, Bynum maintained a look of determination. One row back, captain T.J. Mattson's head fell on the shoulder of quarterback Anthony Hockett as the pair welcomed a quick nap. Near the front of the bus, the coaching staff reviewed the game plan. What was the point of this trip, some wondered, given Eden Prairie's lopsided advantage in players and talent? But Sedlock had sought out the Eagles. They had first played last season. He knew the result likely would be a rout again. But if his players could be on the same field as the state's best and get a glimpse of what it takes to reach that level, it was worth it. Any comfort players had worked up disappeared as the bus pulled up to the stadium. Hanging at the entrance was a list of Eden Prairie's 41 conference, section and state championships, more than the number of South players on the bus. And players couldn't help but notice the massive marching band warming up nearby. 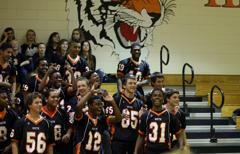 The Eagles' overwhelming crowd had some Tigers thinking it must be the school's homecoming. South's veterans explained to the newbies that sold-out crowds in Eden Prairie are normal. The bleachers on the South side were mostly empty. By halftime, huddled underneath the stadium in a makeshift locker room, the team was shell-shocked. It hadn't scored. Eden Prairie was already playing reserves, on its way to a 42-0 victory. After the game, back on the bus, any sense of glumness appeared to vanish in a hurry, as players hollered at a group of girls walking by. One player yelled to his teammates in protest, "I want to know why ya'll so happy after losing to Eden Prairie?" It did little to change the mood. Alone at the front of the bus, Sedlock lay back and let out a sigh. He was disappointed the offense didn't score. But he took solace in the words of Eden Prairie coach Mike Grant, who addressed the Tigers with an unusual postgame message of hope. "I can't tell you how much we appreciate you guys coming out to play us. You guys play hard every play, right to the end. We have all the respect in the world for you," Grant had said. "Great, classy group. We're really proud of the opportunity to be on the field with you." 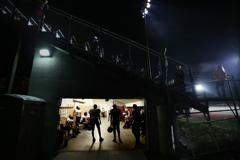 For the first time in South history, night lights flooded the Les Barnard Field, marking the Tigers' final home game of the 2012 season. Sedlock peeked beyond the portable lights at the crowd. He had dreamed of this moment for years. He saw bleachers full of students and alumni. Community leaders, including the Minneapolis Public Schools superintendent and the Augsburg football coaching staff. Most important of all, he saw parents of players who had never seen their sons play. 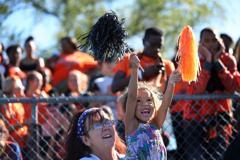 Senior captain Brandon Strong scored three touchdowns as his mother, Barbara, smiled from the stands. Her tattooed name on his chest never meant more. Boisterous cheers, rarely heard at day games, drowned out the hum of the portable lights. Team captain Mattson heard those cheers, but he wasn't on the field. Staying warm in his letter jacket, he stood behind a chain-link fence separating the team from the spectators and held a sign: "Yay South." In August, Mattson drew strength from Vice President Joe Biden, who dropped in on a South practice during a Twin Cities visit. Mattson aspired to be the kind of person who stood by his teammates, as Biden urged, and a team leader, as Sedlock preached during six weeks of special summer classes he put his team through to help them make better choices with their lives. For two months Mattson exemplified those standards. He got to practice on time, helped coaches maintain structure and fulfilled his academic responsibilities. Then came two overwhelming shutout losses, to Eden Prairie and Southwest. A year ago, after a similar letdown on the heels of defeats, 14 players were suspended for violating team rules. After the Southwest loss, Sedlock asked players to keep their poise. 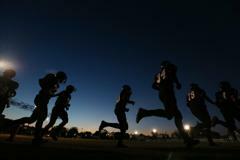 But three days before the Edison night game, a number of players skipped practice and violated other team rules. Sedlock suspended seven of them -- five were seniors, including Mattson -- for the big game. The decisions weren't easy, especially the one involving Mattson. Tuesday afternoon before the historic night game, Sedlock sat with the crestfallen player, skipping practice himself rather than leave his side. Three hours passed as they talked about mistakes and finding a path to mending them. "I felt like I needed to," Sedlock said about sacrificing his afternoon. "Spending time with him ... I wouldn't second-guess that for nothing. To me, he's more important than winning football games." The suspensions gave 13 freshmen a chance to dress and play in the 41-20 victory. In responding to adversity, Sedlock seized a chance to build for the future. Sprinting along the sideline and jolting his fist in the air throughout the night, the rejuvenated coach celebrated his team's weeklong triumph and thought maybe his dream of rebuilding tradition could still be done. "I've never had a feeling like anything tonight. I think it's a step forward," Sedlock said. "The last  years have been like this," jerking his hands in a roller-coaster motion. "This year we were on the way down. But, today, this week, we started on our way back up." 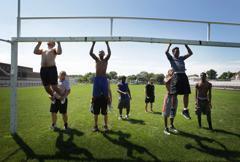 A look at the football season at South High through the lens of Star Tribune photojournalist Jerry Holt. Listen: State tournament soccer, tennis, football previews and a special bonus. 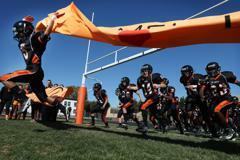 An undermanned team at a large city high school, the South Tigers were followed on the field and off by Star Tribune videographer McKenna Ewen.